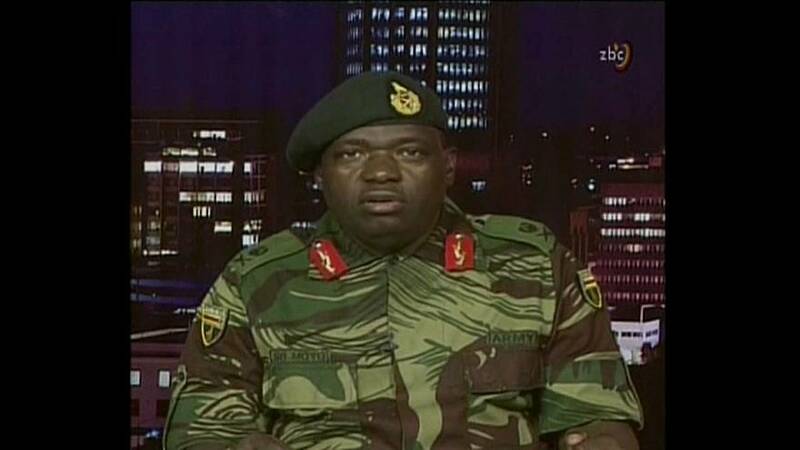 The general who announced the beginning of the end of Robert Mugabe has been appointed the new foreign minister. It is one of two top cabinet positions given to the military by new leader Emmerson Mnangagwa and is widely seen as a reward for instigating change. Major-General Sibusiso Moyo has been made foreign minister and Air Marshal Perrance Shiri has been handed the sensitive land portfolio. Mnangagwa Tweeted: "Our people have endured economic hardships for over two decades and now expect this government to turn things around, within the shortest time possible. "Let us take advantage of the positive optimism among our people, ushered in by this new dispensation, and do our best." But the opposition says hopes for a clean break from the past have faded. Leader of the opposition MDC (Movement for Democratic Change) party, Morgan Tsvangirai, said: "I'm doubtful. It's a change of guard, but no change at all ... which is the one thing that is worrying, because the way they have started. "There is beginning to be concern about what it is that he's laying on the ground... to deal with, to offer an economic plan." Experts say people close to Mugabe remain in the circle of power, meaning past abuses are unlikely to be addressed. Andrew Meldrum, the Acting Africa Editor at the Associated Press, told Euronews from Johannesburg: "Mnangagwa is the minister of defence, minister of security. He was very close to all of the rights abuses that happened. "And also the military and the ruling party, ZANU-PF, that brought him to power, again, they don't want to have a full clean sweep or a truth and justice commission on that. "So I don't think we can expect that. I think we can expect better management of the economy." Mnangagwa was sworn in last week after 93-year-old Mugabe quit in the wake of a "de facto military coup". The new leader said he wanted to use local expertise to revive the economy. He called on former Mugabe minister Patrick Chinamasa to be the acting finance minister, despite criticism during his previous term in that post. Mugabe to Mnangagwa - a real change?